Foreign policy and the role America should play in the world have been subjects of heated debate in both major parties during this year’s U.S. presidential election campaign. A new Pew Research Center survey finds that the American public is uncertain and divided over America’s place in the world, ranging from differences on the greatest threats to the U.S. to the measures the country should take to deal with them. Americans also have mixed views about how assertive a role the U.S. should play internationally. 1 Americans are wary about how much the U.S. should be involved globally. Nearly six-in-ten Americans (57%) want the U.S. “to deal with its own problems and let other countries deal with their own problems as best they can.” Just 37% say the U.S. should help other countries deal with their problems. Still, on some measures, skepticism about U.S. global engagement is not as widespread as in 2013, when it reached historic levels. For instance, while more Americans say the U.S. does too much (41%) rather than too little (27%) to help solve world problems (28% say it does about the right amount), the share saying the U.S. does too much globally stood at 51% three years ago. 2Support for increased defense spending is growing – especially among Republicans. For the first time in more than a decade, more Americans (35%) say spending should be increased than cut (24%). (A plurality of 40% says it should remain about the same.) The share favoring more defense spending has risen 12 percentage points (from 23%) since 2013, with most of the increase coming among Republicans. Fully 61% of Republicans favor higher defense spending, up 24 points from 2013. Support for more defense spending has increased much more modestly among other partisan groups. 3 ISIS is seen as the top global threat facing the country; climate change and refugees are the most politically divisive. Overall, 80% of the public says the Islamic militant group in Iraq and Syria, known as ISIS, is a major threat to the well-being of the country, while 72% classify cyberattacks from other countries as a major threat. 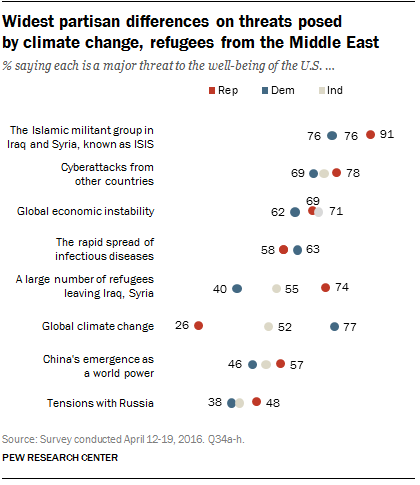 The biggest partisan gaps are over the threats represented by refugees leaving countries like Iraq and Syria, and global climate change. About three-quarters of Republicans (74%) see the refugee issue as a top threat, compared with 40% of Democrats. When it comes to climate change, 77% of Democrats view that as a top threat, compared with just 26% of Republicans. 4Americans remain divided on the best way to defeat global terrorism. The belief that overwhelming military force is the best way to defeat terrorism is held by 47% of the public, but an equal number says relying on that strategy too much creates hatred that leads to more terrorism. The partisan gap on this question is wide: 70% of Republicans say military force is the best approach, while 65% of Democrats take the opposite view. The gap is even bigger between conservative Republicans and liberal Democrats. 5 There’s a persistent partisan gap in sympathies for Israel and the Palestinians. Americans continue to express more sympathy for Israel in the dispute than for the Palestinians (54% vs. 19%), though the share sympathizing more with the Palestinians has risen 5 points since July 2014. 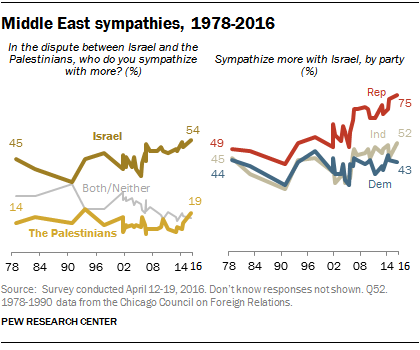 Both Republicans and Democrats are more likely to sympathize with Israel than with the Palestinians, though that margin is far wider among Republicans (75% vs. 7%) than among Democrats (43% vs. 29%). And within the Democratic Party, there are stark differences by ideology: A 53% majority of conservative and moderate Democrats sympathize more with Israel, but liberal Democrats are statistically divided in their views. While a third of liberal Democrats (33%) sympathize more with Israel, 40% express more sympathy for the Palestinians. 6Americans overwhelmingly view NATO membership as beneficial for the U.S. Republican presidential candidate Donald Trump injected the issue of the U.S. role in NATO into the campaign by questioning its value. Among the public, 77% say being a member of NATO is a good thing for the U.S. — a view held by large majorities in both parties. Three-in-ten Trump supporters say being a member of NATO is a bad thing for the U.S., the highest share among the supporters of any presidential candidate. But even among Trump backers, most (64%) see NATO as a good thing for the U.S.
7In addition to divides between the parties, there are several big gaps within both the Republican and Democratic camps on America’s role in the world. For instance, among Democratic voters, about two-thirds (68%) of those supporting Bernie Sanders are more worried that the U.S. military action in Iraq and Syria will go too far in getting involved, compared with about half (53%) of those who support Hillary Clinton. Sanders supporters also are more likely than Clinton supporters to say their bigger concern about U.S. anti-terrorism policies is that they have gone too far in restricting civil liberties (51% vs. 35%). And on the GOP side, 65% of those who support Trump say U.S. involvement in the global economy is a bad thing, compared with only about half of Ted Cruz backers (49%) or John Kasich supporters (46%). (The survey was conducted before Cruz and Kasich dropped out of the GOP race.) On national security, Trump supporters are more likely to view the large numbers of refugees leaving Iraq and Syria as a major threat to the U.S. (85%) than do backers of Cruz (74%) and Kasich (59%).